Zoto is back with the Zoto mobile recharge app version 2.0. This time, you get a whooping N1000 credit to recharge you line on any network when you credit your ZotoCash account with just N50. 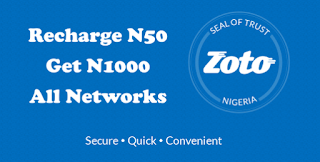 The Zoto mobile recharge app helps you recharge easily on MTN, Airtel, Glo, Etisalat etc with attractive discount on every recharge. 1. Click here to download and install the Zoto app. 4. After verification, fill in your complete details and confirm the referral or tick “I have Referral” and input this code 0ITY2070. 5. Ensure your put this username or else you won't get the offer ensure your put this username or else you won't get the offer. 6. Once you have type in the code and completed your registration you would be given N1000 when you make a first recharge of N50. Note that you will use your ATM card to recharge the N50. 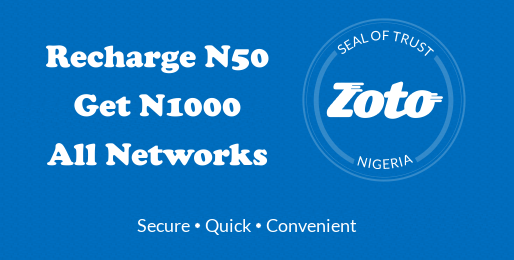 Don’t worry about security, backed with first class encrypted security feature and licensed by the CBN, Zoto handles all your recharges smoothly and securely. After that you can now share your referral name or link to get N1000 airtime when you refer a friend. To get your referral code, slide from left to reveal the menu and tap on “Invite and Earn”. To send airtime to your contacts. Simply click on the + icon on your home page to select a contact. Once you select the contact you'd like to recharge, proceed to payment as usual. Don't forget to share this post with your friends on Facebook to get more referrals and if you encounter any difficulty you can let us know via comment box below.